To process orders quickly, YogaHabits only offers products that are in stock. All available products are displayed in the shop (in the specified sizes and colors/prints/variations). IF ORDERED (AND PAID) BEFORE 12:00 O'CLOCK ON WORK DAYS, IN MOST CASES YOU WILL ALREADY RECEIVE YOUR PACKAGE THE NEXT DAY! In any case, your order will be shipped within 2 work days. LOW-PRICED SHIPPING: €3,95 per order (for orders in The Netherlands). Shipping within The Netherlands is free for orders of €75 or more. Orders will be processed and shipped within 1 to 2 work days. Whenever possible, your package will be shipped in a 'mailbox package'. This way you don't have to stay home for delivery. If it does not fit in the mailbox, we send it with PostNL package service for the same price. The supplied Track & Trace information will show you the final shipping method. After the first delivery attempt, PostNL provides the possibility to indicate a desired delivery time and location. YogaHabits aims to ship on the same on the day of your order (after the financial transaction is processed succesfully). Orders for the Netherlands are usually delivered within 2 work days (and often the next day). 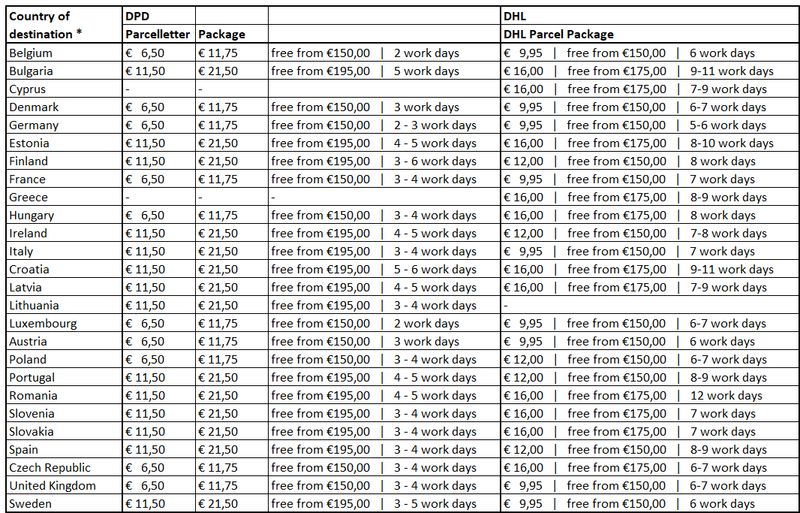 Evening delivery for €5,95 per order (supplement €2,00). Orders are sent via PostNL package service. Pick-up at one of the PostNL service points: for €5,95 the package can be delivered at one of the indicated PostNL service points. FOLLOW YOUR ORDER: After shipping, we will send you a 'tracking number' via e-mail. With this unique number you can track and trace your package via the link PostNL Track & Trace. We ship to other countries than the Netherlands via parcel services of DHL Parcel & DPD. See the table below for the possibilities. DPD parcelletter is only applicable if the products fit in a letterbox package: the parcelletter will be delivered in the mailbox and you can follow the status via a track & trace code. The noted delivery time is an indication of the transit time from the moment that YogaHabits sends the package (usually the same day if ordered on a work day before 12 O'Clock). Although most parcels are delivered within the indicated time (or even quicker), from time to time and from matters outside our control they may take longer. * Parcel shipments to PO box addresses and answer numbers are excluded. Delivery on islands (except Great Britain and Ireland) is not always possible or only at an additional charge. Please contact us via service@yogahabits.nl for the options and rates. If DPD parcelletter is possible with regard to your order depends on if the products with in a letterbox package. Outside the EU, additional VAT and custom costs can be applicable. All customs fees, duties and taxes are the responsibility of the customer. The cancellation period is 30 days on all products (including sale items), starting from the day after delivery. These products should be returned to (and received by YogaHabits) within 14 days from the notice of cancellation or (if you did not notify us in advance) 30 days from the day after delivery of the order. Of course, trying on the yoga clothes is allowed. However, all return/exchange products must be returned to YogaHabits undamaged, unused, unwashed and - whenever possible - in its original packaging (including all original label(s) & garment tags). Refunds on return products will only be issued after YogaHabits has checked and approved the returned products. Please note that we cannot accept back any mat/towel where the wrapping/seal around it has been removed or damaged. Please do not unpack/unroll a mat/towel to look at it if you are unsure whether you want to keep the product, as due to hygienic reasons we will not be able to exchange or refund you in these circumstances. Colour, dimensions, thickness and weight of all mats/towels are displayed on our site and we are happy to give you advice by e-mail or telephone on the best mat / towel for you before purchase. Obviously when the mat / towel remains in its packaging we will happily exchange/refund you following the terms of our standard return policy. If upon receiving return products, YogaHabits notices that you have done more than check out the product like you would in a store, or the product has otherwise been damaged, YogaHabits may charge compensation for this damage. You must notify us of a return/exchange within the cancellation period via a ticket, e-mail or the product must be returned to us together with a cancellation form within the cancellation period. If you exchange an item for a different item, YogaHabits will provide one time free shipping (per order and for delivery within The Netherlands) of your exchange product. Please use our cancellation form for exchanges as well. At your own expense via post office or parcel. Send the sealed package back through the post office or another parcel service of your choice (estimated cost €4,35 to €6.95 within the Netherlands). Make sure you receive proof for shipping from the post office or parcel service. For returns from abroad, we recommend to also check the shipping possibilities by DHL Parcel and DPD. Hand deliver to the YogaHabits office location in Haarlem. If you would like to return the package yourself, you can put it in the mailbox of our office (Kruisweg 72-zwart) in Haarlem. For packages that do not fit through the mailbox, make sure you check the opening hours of Bikram Yoga Haarlem in advance (packages can only be delivered during front desk opening hours). Bikram Yoga Haarlem's front desk is only open 25 minutes before and 30 minutes after one of the yoga classes (not during the yoga classes!). Be sure to check Bikram Yoga Haarlem's opening times. Checks with regard to the returned product(s), your refund and further processing of the return is carried out by YogaHabits within 14 days after receiving the return package. Please note that Bikram Yoga Haarlem does not deal with your return other than accepting it from you at the front desk. For exchanges, please send us an exchange request (within the cancellation period). To this end please create a ticket or send an e-mail to info@yogahabits.nl. Please indicate both the item you would like to return and the requested exchange product including specifications such as size and print. Return the product -see Return & Exchange Options- in a sealed package including the return form. Be sure to save your proof of shipment. On the return form, specify clearly for what product you want to exchange the returned product. After processing the return notification, YogaHabits will offset the returned product with the replacement product financially. YogaHabits will cover the shipping costs for sending the exchange item (within the Netherlands) once only per order. The exchange product will be shipped upon receipt of the return product as soon as possible. Return the product -see Return options above- in a sealed package including the completed return form. Be sure to hold on to the proof of shipment. Remember the 30 days cancellation period. Once the return is received, we will verify it and pay applicable refunds within 14 days via the payment method of ordering. If you paid us for shipping and are returning your complete order, we will reimburse the amount of our "Low-Priced Shipping Method". YogaHabits takes great care in processing your order. However, if you nonetheless received a different product than you ordered, please contact us as soon as possible (and in any event within 30 days) via phone: (023) 2052021 or e-mail: info@yogahabits.nl. Let us know which product you had ordered and which product your have received. We will immediately put the correct product aside for you. Return the wrong product including the return form as described under Returns. YogaHabits will send you the correct product as soon as possible and will reimburse for additional shipping costs.